My last article was a tongue-in-cheek look at the lighter side of how to handle the "tapir" of Quantitative Easing; this article will be a bit more on the serious side. Scientists tell us that the highest number the average human can comprehend, without counting or guessing, is (are you ready? ): 4. When we get to 5, people can figure it quickly by counting, but most of us don't instinctively comprehend numbers larger than 4. To quickly validate this research, imagine the last time you stopped at a restaurant for an impromptu dinner with a group of family or friends. Most likely, when the host asked, "How many in your party?" you had to run a quick count in your head, even though it may have only been eight or nine people. When it's just you and your significant other plus one other couple, you automatically know the party size is 4; but when there are kids and grandparents and aunts and uncles, we have to count. My point is, when we start dealing with the types of numbers we deal with in finance, the quantities become incomprehensible to us. To my knowledge, scientists haven't drawn an exact line as to where numbers reach the point of being completely unfathomable, but I think we can draw our own rational conclusions with a bit of mental experimenting. Consider that on an unusually clear night, there are "only" a few thousand stars actually visible to the naked eye -- yet to the human mind, their numbers seem infinite. Weigh that visualization of "a few thousand" against a number such as two trillion. We quickly find we can't wrap our heads around it and mental tricks fall short. Try it: A million is a thousand thousand, so: let's start with something we can visualize, like the night sky. To reach a million, simply multiply the number of stars in the entire night sky by a factor of three hundred or so. Theoretically, that gets us to a million, but our minds are already cheating and we end up visualizing something akin to "a whole bunch." To get to one trillion, we have to visualize a million million -- so we have to multiply a number we can't visualize by another number we can't visualize (and then we have to double the sum!) Our minds don't even really try, and all they can come up with is: "Wow, a whole bunch more!" I would argue that when it comes to the huge figures we're dealing with in programs like Quantitative Easing (and things like the national debt), we just flat out have no clue what the numbers mean. The numbers are so big, in fact, that we can't even understand how big they actually are (if that makes sense). 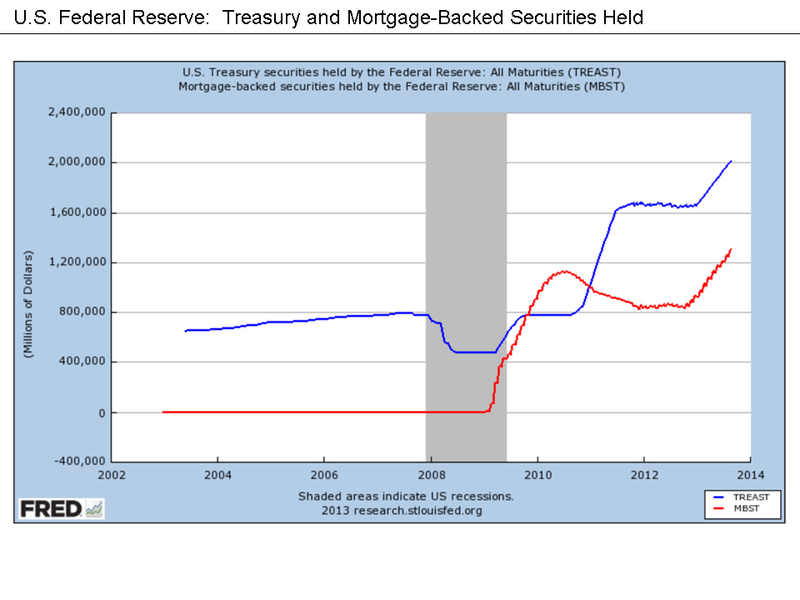 Since 2009, the Fed's total holdings (of both) have increased by about $2.8 trillion -- roughly a factor of six. Do those numbers find any traction in your head, beyond, "Wow, that's a lot of money"? Because they don't in mine. The main thing my mind does is look at the graph and pretend those were numbers I could understand in personal or business finance, and then it comes up with: "That doesn't look healthy." The present upwards trend simply cannot continue infinitely in a linear fashion, because the Fed does not have the ability to take on an infinite balance sheet. So, from that simple fact, we know the present moment is fleeting and cannot continue. That presents problem one: what happens when the Fed stops expanding its balance sheet? Problem two is how does the Fed backtrack and shrink its balance sheet in order to engineer a 'soft landing' at some point? Can they? Many would argue that the Fed is now trapped by its own machinations. The Fed has become a bit like DeBeers is with diamonds: they can control prices as long as they can absorb and regulate the supply. The advantage DeBeers has is that diamond production is much, much slower than Treasury production. And unlike the Fed, DeBeers "only" has several billion dollars worth of diamonds in its vaults -- yet if by some chance they were forced to liquidate the entire vault tomorrow, diamond prices would drop like a rock (pun intended). The Fed faces a similar dilemma. Further, just like DeBeers, if the Fed were to abandon the business of purchasing new supply, prices would fall because a huge source of demand suddenly disappeared. On Friday we saw how Bernanke handles the dreaded Tapir (it's handled just like everything else: feed it money) -- but the real question is: how does the Fed handle the taper of QE? I don't think there are any easy answers. 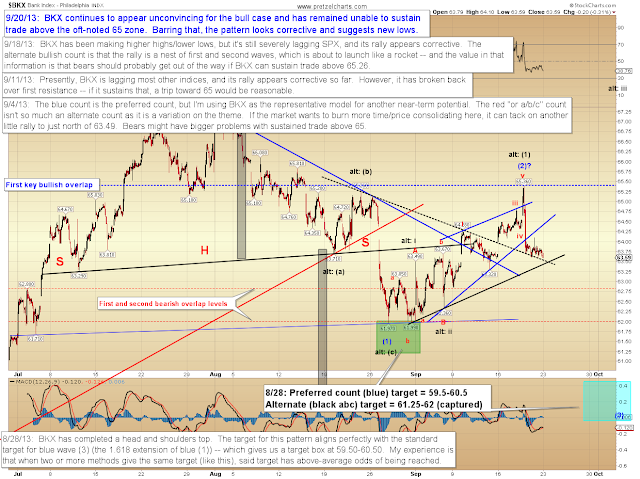 Chart-wise, there isn't much to add to Friday's update: presently the decline works as a passable ABC, but a bit more downside will begin to give it an impulsive appearance -- and as I noted Friday, there are enough waves in place for the upwards move to be complete. Theoretically, support lies in the 1695-1705 zone, and bulls could start to run into more serious problems if the market sustains trade beneath that zone. It's getting hard not to notice that the pattern, presently at least, appears to be a bearish rising wedge (it could also pass for a Three Drives to a Top pattern). The normal expectations of a wedge are for the market to return to the point at which it began; in this case the mid-to-high 1500's. 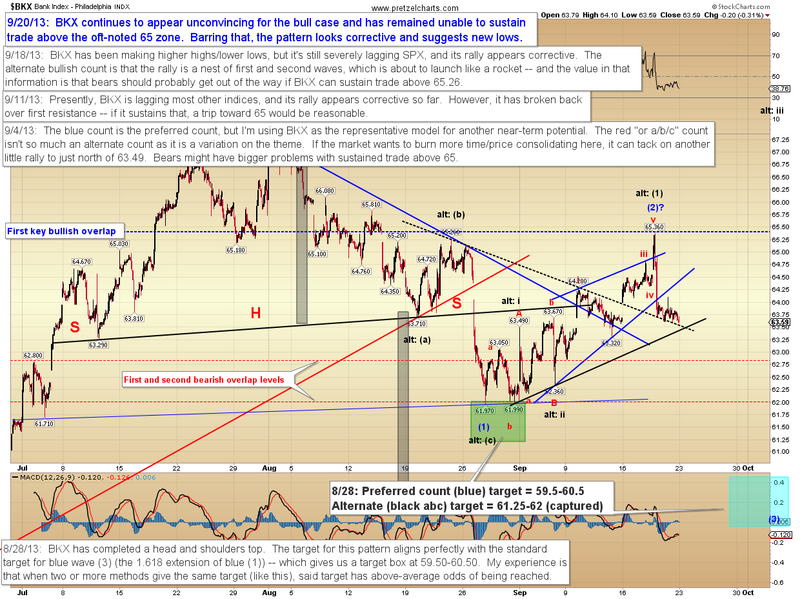 The Philadelphia Bank Index (BKX) continues to look weak, and may be the canary in the coal mine here. Long-time readers know I believe that trouble for BKX equates to trouble for the broad market, and BKX still looks like it wants new lows. In conclusion, I continue to feel that downside risk outweighs upside risk at this moment. Bulls could do a few things to change that -- for example, a breakout in BKX would go a long way toward causing me to rethink my position. 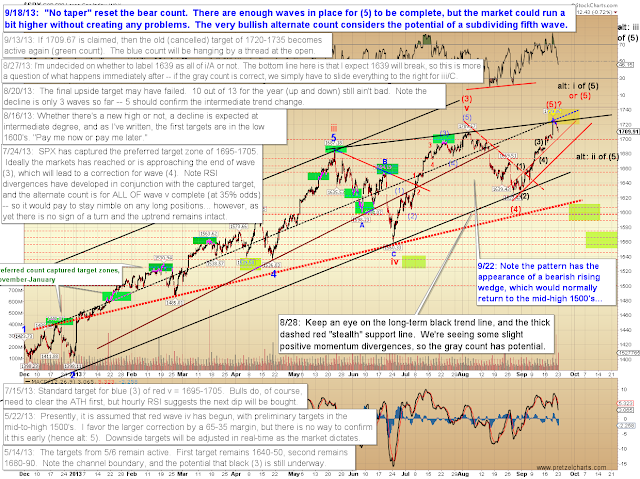 Barring that, I remain unconvinced that the present rally has staying power; and the market hasn't shown me anything recently to change that view. Trade safe.